A few days ago, the New York Times published the latest high profile story advocating for a ban of laptops from classrooms, mostly at the college level. 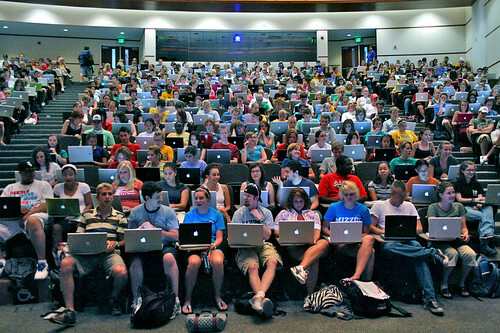 They all point to a “growing body of evidence” claiming to show that students learn less and get poorer grades when they use devices during lectures. I was going to chime in with my thoughts on the matter, including more than a few questions about the methodology and assumptions behind these studies. But marketing guru Seth Godin, who occasionally chimes in on education issues (and often makes a lot of sense), has already written a high profile response that has popped into my Twitter feed many times in the past few days. While it’s not a great challenge to this simplistic nonsense, at least Godin is exactly right that the professor who authored the Times op-ed has missed the real issue. Why give lectures at all? Why offer a handmade, real-time oration for a small audience of students—students who are expected to slow down their clock speed, listen attentively and take good notes at the very same rate as all the other students? I know why we used to do it. We used to do it because a lecture is a thoughtful exposition, a reasoned, researched argument that delivers a lot of information in a fairly condensed period of time. And before technology, the best way to deliver that exposition was to do it live. Godin’s recommendation to replace the live lecture – basically going to the “flipped” classroom approach and have students watch a recording of the presentation outside of class – is a crappy alternative. But he does ask the right question: Why lectures? Why do we continue with the “watch presentation-take notes-answer test questions” approach to learning? Especially since it is becoming clear that this is not an effective learning process. Which leads to the other half of this question: if we’re not going to lecture at students, what do with do with all that “precious classroom time”? And it is precious. It’s a curated group of thirty or a hundred students, coordinated in real-time and in real-space, inhabiting a very expensive room, simultaneously. The K-12 experience is thirteen years built on compliance and obedience, a systemic effort to train kids to become cogs in the industrial machine. And it has worked. One component of this regime is the top-down nature of the classroom. We don’t want to train kids to ask difficult questions, so we lecture at them. Although teachers in K12 don’t perform as many lectures as college instructors1, most classrooms are still structured around direct instruction. With material structured by the adults and presented to students, who are then expected to extract the required information, and recall it on some kind of test at some later time. In the end, however, my biggest objection to all these “laptops are making kids stupid” stories is that the researchers – and the writers reporting on their work – always start by blindly blaming the technology and the students. And assuming our current educational structure is above reproach and needs no alteration. 1 However, the lecture format is still a fundamental part of many high school courses, especially Advanced Placement, which is essentially a college course adapted for slightly younger students. Picture from Flickr and used under Creative Commons license from brett jordan. Tis the time for year-end reviews, as EdSurge1”[A]n independent information resource and community for everyone involved in education technology.”does with “MOOCs in 2015: Breaking Down the Numbers”. According to them, the number of students enrolling in MOOCs has doubled with “the total number of students who signed up for at least one course has crossed 35 million–up from an estimated 17 million last year”. The number of courses offered has also increased, with “1,800 new courses were announced, taking the total number of courses to 4,200 from over 550 universities”. The usual suspects are still at the top as “Coursera, edX and the Canvas remain the top three providers of courses”. And lots more statistics – languages used (English fell… a little), best reviewed courses, the top rated universities – along with some trends (evidentally free certificates are dead). Missing from the report, however, is anything about how many students actually completed the courses. Or about whether the instruction was beneficial to their academic life (or their actual life). Or whether students felt the money, time, and effort they put into the MOOC was worthwhile. For 2016 “MOOC providers have started targeting high schoolers with the intentions of closing the college readiness gap, helping students to get a taste of different majors through introductory courses, and providing exam preparation (like AP) courses”. And increasing their business. Because, as best I can understand from reading EdSurge, MOOCs are all about the business, not learning. A college professor writing in the New Yorker makes the case for banning laptops in the classroom. Or at least he tries – and largely fails. …the temptation for distraction was high. I know that I have a hard time staying on task when the option to check out at any momentary lull is available; I assumed that this must be true for my students, as well. I wonder if he asked his students about the situation in addition to assuming their experience was just like his. And why is their temptation for distraction so high? Then, after discussing research that tried to incorporate more precision in to the investigative process, he at least approaches a part of the problem that does not assign sole blame to the technology. These examples can be seen as the progeny of an ill-conceived union of twenty-first-century tools (computers, tablets, smartphones) with nineteenth-century modalities (lectures). But that recognition doesn’t last long. Common to all of these contexts is the human-machine interaction. Our “digital assistants” are platforms for play and socializing; it makes sense, then, that we would approach those devices as game and chat machines, rather than as learning portals. It really doesn’t make sense. You’re the teacher. If you want your students to approach their devices as learning portals, then structure your instructional practice to fit that idea. Don’t assume they graduated high school with that understanding. Anyway, he ends the piece with this grudging conclusion. In other words, we need more research about how we can keep our “nineteenth-century modality” for delivering information to students, followed closely by our time-honored assessment system of course, and “resist the impulse” to allow “new, trendy” things like laptops and wifi to be used. Again, did any of these professors bother to talk to their students about how they learn best? Did any of them consider that maybe their approach to teaching was the part of the problem that needed fixing? This essay reflects the university-level experience through the lens of a small group of professors. However, we have many K12 teachers who express similar feelings (and fears) about “twenty-first century tools” intruding on their traditional instructional methods.